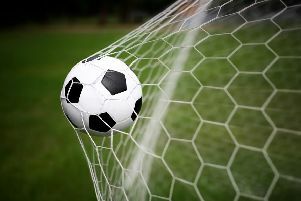 Chichester City Ladies’ Women’s Premier League Cup run came to a crashing end at the hands of last season’s beaten finalists, Cardiff City Ladies. It was a chastening experience but the scoreline flattered the hosts as Chichester didn’t deserve to be on the end of such a result. The gulf in class was evident, though, and the management have plenty of food for thought – but the squad were able to return home with heads held high. Kerry Bartlett opened the scoring for Cardiff in the second minute, latching on to a sublime cross from Chloe Lloyd. Chichester needed to respond quickly and were soon back on level terms through Chloe Dowdell. Goalkeeper Laura O’Sullivan flapped at a corner from Lucie Challen and Jess Lewry headed the ball back towards goal only to see the effort hit the bar. The ball came down on the line and Dowdell was the first to react to the loose ball to poke it into the unguarded net. That was as good as it got for Chichester. Cardiff began to break down the visitors’ defences at will as the half wore on. In quick time they had established a two-goal lead through a swift double from Laura Williams and around the half-hour strikes from Cori Williams, Chloe Chivers and Abbie Britton ended the tie as a contest. Cardiff hit the bar several times through Williams, Lloyd and Chivers before the interval with Chichester having to endure wave after wave of attack. City held firm and Sally-Anne Thompson made some terrific saves. Kally Ambler came on for the restart to replace Laura Ingram, who was returning after injury, and the Green Army were a completely-different side, showing a huge improvement in determination and creating a lot more. Cardiff’s defence had little problem in preventing shots on goal but Chichester’s passing was more direct. Cardiff did manage to add one more goal to their tally before the end as Williams nailed her hat-trick with a terrific shot from long distance. The ladies are in FA Cup action at Oaklands Park on Sunday against Keynsham Town Ladies (1pm). CCLFC: Thompson, Price, Wilson-Blakely, Cheshire, Challen, Dowdell, Widdows, Lewry, Ingram, Ryan,Alexandre. Subs: Ambler, Parkes, Widdowson. * Chi’s development squad lost 1-0 at home to Glebe Ladies in the first round of the South East Counties League Cup. City’s under-16 girls won 7-0 at home to Cuckfield Cosmos. Alex Collighan scored five and Loulou Robson and Holly Heffron netted one each. The under-14s lost 4-2 away to Oakwood Youth. Elishia Hounsome scored both their goals. Chi’s under-12s won 3-1 away to Withdean Youth. Eve Clarke and Ellen Middleton were on target plus an own goal.